Many applications demand more from a lens than the performance delivered by standard imaging lenses, which introduces the need for ruggedized imaging lenses. A new imaging choice is the Stability Ruggedized imaging lens. Historically, Industrial and Ingress Protection Ruggedized imaging lenses have addressed many environmental and application challenges. But as imaging systems increase the number of moving elements and as products move through inspection systems faster for higher throughput, these movements require greater calibration and image performance. As applications like factory automation, measurement, robotics and autonomous vehicles continue to expand and develop, the need for Stability Ruggedized imaging lenses will increase along with the progression of the industry. Each of these applications presents environmental challenges–such as shock, vibration, and contamination–to imaging systems. Unlike lab and observatory setups, which tend to have relatively controlled environments, manufacturing facilities can be rife with environmental operating difficulties. To address these challenges, ruggedized imaging lenses have a number of features and benefits. But to determine the best ruggedized lens for an application, first let’s clearly define the various ruggedization techniques. A standard imaging lens can be insufficient in some applications and environments due to the large number of moving parts within the lens assembly, such as the doubled threaded focus adjustment, the multi-leaf iris diaphragms, and their corresponding thumb screws. For example, the thin overlapped iris leaves are especially susceptible to high shock and vibration, which can cause them to easily spring out of place and be damaged. By replacing the iris leaves with a fixed aperture, the survivability of the lens can be greatly improved. Another component of the lens that may come loose during shock and vibration are the thumbscrews. Although they may not completely fall off, they can be loosened enough that the focus changes, potentially degrading the image quality. On a machine vision inspection system, faulty image quality can increase the potential to reject passing units or pass failing units. Debris and contaminants in the area can compound these effects. Historically, there have been two primary ruggedization techniques to address these environmental difficulties – Industrial Ruggedization and Ingress Protection Ruggedization. the thumb screws are replaced with set screws. Industrial Ruggedization prevents many of the unintentional movements and focus shifts described above, and therefore maintains ideal image quality. Industrial Ruggedized imaging lenses can also prevent a user from accidentally changing the focus and iris settings. In an Ingress Protection Ruggedized imaging lens, the lens assembly is either fully enclosed or sealed with O-rings (or RTV silicone) to withstand environmental contaminants. IP66 or IP67 environmental ratings are the most well known standards for particulate and water resistance. Enclosures and seals can be especially critical for lenses used to inspect food quality. The lenses must withstand direct exposure to liquids and humidity in such wash down applications. Many manufacturing, processing, and packaging applications are in unfavorable environments where dust, debris, dirt, adhesives or fluids are commonplace. 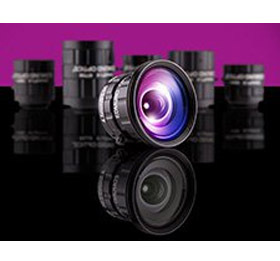 Ingress Protection Ruggedized imaging lenses are designed to withstand these harsh environments. Some of today’s more demanding applications in factory automation, measurement, robotics, and autonomous vehicles levy additional requirements on imaging systems beyond those of Industrial Ruggedization and Ingress Protection Ruggedization. In such situations, there’s another type of ruggedization: Stability Ruggedization. The Edmund Optics TECHSPEC Compact Ruggedized (Cr) Series Fixed Focal Length Lenses are an example of Stability Ruggedized imaging lenses. While Ingress Protection Ruggedization prevents contamination and Industrial Ruggedization eliminates moving parts, Stability Ruggedization maintains (or stabilizes) optical pointing and positioning even after heavy shock, vibration and temperature change. In a Stability Ruggedized imaging lens, the individual lens elements are glued into place to prevent them from moving within the housing. In an optical system, lens elements sit within the inner bore of the barrel. The space between the outer diameter of the lens and inner diameter of the barrel is typically less than 50 microns; decenters of even tens of microns are enough to significantly affect the pointing of the lens. When using a Stability Ruggedized lens, if an object point falls on the exact center pixel, it will always fall there even if the lens has been heavily vibrated; therefore pixel shift is reduced and the image is stabilized. Even in clean inspection environments with well-controlled robotic movements, there are challenges. Conveyer lines and robotic systems move at higher speeds and handle heavier products than ever before. Vibration comes from operation speeds and weight of the objects, or by the lines and systems located next to equipment. These high intensity environments create tough shock and vibration requirements for imaging systems, making the lens performance more critical. Additionally, users have higher resolution and image quality expectations. As camera pixel sizes become smaller, even slight misalignments in imaging systems become apparent. Pointing and alignment changes that were once unnoticeable with a camera having 5.6 micron pixels may be very obvious with a camera having 1.4 micron pixels either over time or after a strong shock. Stability Ruggedization is important in applications where the field of view must be calibrated, such as measurement equipment, 3D stereo vision, lenses used for robotic sensing, and lenses used for tracking object locations. These applications often require the pointing to be stabilized to values much smaller than a single pixel. In 3D stereo vision, two imaging lenses are used to image a pattern that’s been projected onto a 3D object. The two images are then compared to extract the 3D information about the object, but to do this the angle of the two lenses and field of view must be well calibrated. Once calibrated, any shift in the pixel mapping will offset the information in the 3D model, affecting the measurements. Many times these systems experience heavy shock and temperature shifts during shipping or relocation. If the system were to require recalibration for each relocation, it would be costly to send a technician onsite, whereas setting up and calibrating the system once would keep costs down. Another similar application is distortion calibration. Information is not lost in an imaging system that has distortion – the information is simply moved. Distortion can be mapped or calibrated from your imaging systems to remove it. If pixel shift occurs, the distortion mapped is now incorrect; shifting the distortion calibration map can move your values affecting your accuracy. Another recent challenge machine vision imaging systems face is an increase in traditional robotic imaging systems crossing over into autonomous systems, along with many embedded vision solutions beyond the relatively stationary conveyer line and robotic setups. Vision enabled robots rely on imaging systems to know where they are in space. As robots move to perform their task, the constant movement can cause pixel shift, affecting their ability to know where they are and their accuracy. Machine vision is also expanding beyond the final pack-out robots on a line. After products are packaged and boxed up, vision-guided robots can transport and load them on and off of trucks – even the trucks themselves may be autonomous vehicles, guided by many sensors including vision. Back in the factory and warehouses, there are more autonomous robots, driving or flying around to move products or inspect storage locations. Large distribution centers often carry a variety of goods, inspection and handling systems to handle a variety of weights, sizes, and packaging materials. As industrial machine vision systems make their way outside of typical applications and onto autonomous vehicles, once ‘controlled’ environments, no matter how challenging, are no longer controlled in many ways.